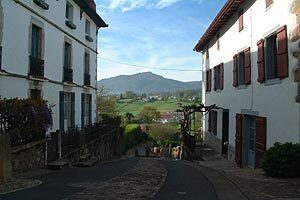 Perhaps less well known here in the Pyrenees-Atlantiques region of France are the traditional basque villages, but it is highly recommended that you include a few as part of your visit to get a taste for the more traditional way of life in the region over the centuries – before the surfers and cyclists turned up! The traditional village architecture here is very distinctive with whitewashed houses, often half-timbered, quite flat roofs, and shutters and woodwork usually painted blood red or a rich green colour. Other colours are very unusual in these parts! 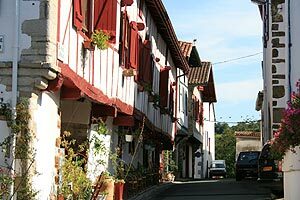 Other characteristics of these villages include their small churches with balconies running around the inside, and many also have a ‘fronton court’ (a sort of outdoor squash court) in the village centre. Heading inland from the coast your visit will probably start with Sare or Ainhoa. 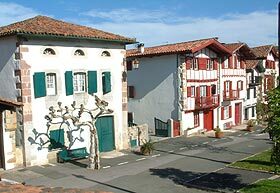 Both of these are officially listed among the ‘most beautiful villages in France’ and both are lovely examples of basque villages. Ainhoa has the interesting characteristic that the houses are more decorative along one side of the street than the other – this is actually because all the houses are built to protect against the strong winds blowing in from the Atlantic so on the west of the street you are looking at the fronts of houses but on the east side you are looking at the backs of houses! Betwen these two villages you can take a small tourist train up the Rhune mountain which is a popular and scenic tourist excursion. Two particularly pretty villages are found a little way to the north-east of here at Itxassou and Espelette. While I wouldn't like to choose a favourite among these basque villages Espelette in late summer is particularly interesting because a large number of chillies are grown in the region and then hung out on the buildings to dry, which is a very picturesque sight. There is also a ‘festival of piments’ in October – and plenty of opportunities to buy chillie based products all year round. Itxassou is a much quieter village than Espelette and a nice opportunity to enjoy the local architecture with less tourists around. To complete your exploration of the basque villages continue heading north-east to La Bastide-Clairence. Like Sare and Ainhoa, La Bastide-Clairence is listed as one of the ‘most beautiful villages in France’. The village dates from the 14th century and also has a good selection of local artisan products in the shops. The town is well known in the region for a popular pottery fair held here in September each year. Depending where you are spending your visit you will come across more of these small Basque towns as you explore, almost all with the extra advantage of being surrounded by the lovely scenery of the western Pyrenees, and in excellent walking and cycling territory. Highly recommended. If you are staying on or near the Atlantic coast of south-west France, either Biarritz or its quieter neighbour at Saint-Jean-de-Luz are ideal bases for exploring the region (Biarritz also has an airport with cheap flights from the UK, so you can spend a weekend here very easily).